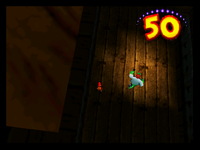 Stealthy Snoop is a Bonus Stage found in the game Donkey Kong 64. After the player jumps in the Bonus Barrel, they can play this game to try and win a Golden Banana. In this minigame, the player will need to navigate through a maze in the time-limit and avoid being captured by Kops who patrol the maze using flashlights. If the player gets caught in their light beams, they will lose the minigame. If the Kong reaches the checkered flag at one end of the maze, they will be rewarded with a Golden Banana. Sneak around the maze to the checkered flag! Two other Stealthy Snoop challenges can be found in the game coding, the first has a time-limit of 60 seconds and the second has 90 seconds which is slightly longer. This is one of only three minigames in Donkey Kong 64 to not use the bonus stage theme used by all other minigames, the others being Mad Maze Maul and Minecart Mayhem. It instead has its own unique music track. This page was last edited on March 2, 2018, at 22:59.